Baron Denis Hoban Ceannaire of the Hoban Clan is to receive the Queen Elizabeth II Diamond Jubiliee Medal. 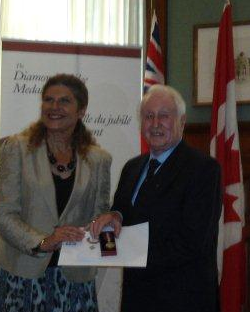 The Medal was created to commemorate the Diamond Jubilee of the Queen of Canada in 2012. Baron Hoban is being honoured for his contributions to Canadian Society.